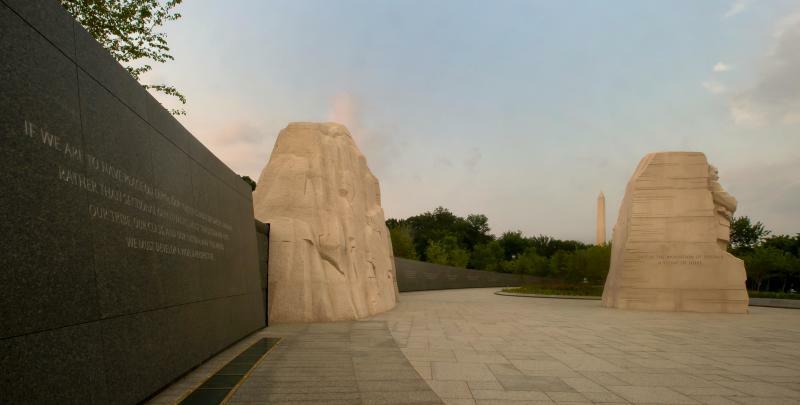 The Martin Luther King, Jr. Memorial is situated on a four-acre site along the National Mall's Tidal Basin, adjacent to the Franklin Delano Roosevelt Memorial and shares a direct line of sight between the Lincoln and Jefferson memorials. Its official address is 1964 Independence Avenue SW, in honor of the Civl Rights Act of 1964. Dr. Martin Luther King, Jr. was one of the most prominent leaders of the Civil Rights Movement in the 1960s. The most convenient way to reach the Martin Luther King, Jr. Memorial is by Metrobus or Metro. If traveling by bus, use the 32, 34 or 36 Metrobus routes. The closest Metro stop is Smithsonian, on the Orange, Blue and Silver lines. Of course, the memorial is in very close proximity to the other memorials surrounding the Tidal Basin. The Martin Luther King, Jr. Memorial is open 24 hours a day, 7 days a week. There is no fee to visit. National Park Service rangers are on site to answer questions from 9:30 a.m. to 10 p.m. daily. Interpretive programs are available throughout the day and upon request.